Kiwis and papayas are excellent fruits at this time of year, when the citrus season is coming to an end and the summer fruits have not yet arrived. Kiwis contain the highest concentration of vitamin C in any fruit and papayas, as well as being and excellent source of vitamin A, are an excellent digestive after a meaty main course. These tasty puff pastry tartlets are ideal served after the recipe for Roast Lamb Fillet with Parsley Potato Crush. Preheat the oven to 200°C, gas mark 6. Roll out the pastry large enough to cut out four 10cm circles. Transfer the pastry circles to a greased baking sheet and cover with clingfilm. Chill for 10 minutes. Using a vegetable peeler, peel the skins from the papaya and kiwi fruit. Cut the papaya in half lengthways, and using a teaspoon, scoop out and discard the seeds. Thinly slice the papaya flesh lengthways and the kiwi fruit into thin rounds. 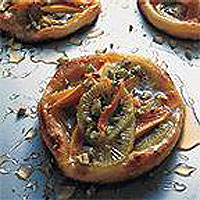 Arrange the sliced papaya and kiwi on top of the pastry circles. Drizzle with one tablespoon of the honey and bake for 15-20 minutes, until puffed up and golden. Remove from the baking sheet and transfer to warmed serving plates. Sprinkle over the pistachios and drizzle over the remaining honey. Serve warm with Waitrose Clotted Cream Ice Cream. Add extra flavour to your tartlets by using one of Waitrose's more unusual clear honeys. Waitrose Orange Blossom Honey is fragrant and delicious. If you prefer, you can make one large tart by rolling out the pastry to a 20cm circle. Continue with the recipe as for the individual tarts, but increase the cooking time to 20-25 minutes. You can freeze any leftover puff pastry.